In the Pacific Northwest, the climate is perfect for orchards to burst with pears, berries, quince and hazelnuts. Our Oregon growers have created three fresh fruit pâtés, a delicacy that's perfect on bread or crackers, and an even better accompaniment to fine aged cheeses. With an olive wood serving spoon that will never upset the delicate balance of flavors in the fruit, these pâtés are nestled in our exclusive birchwood crate, creating a lovely gift for foodies or any sophisticated sweet tooth. Quince Fruit Pâté, Perfect with Aged Manchego. Strawberry Fig Pâté, Try with Soft-Ripened Cheese. Pear Hazelnut Pâté, Complements any Bleu Cheese. What else is in this gift crate? Each gourmet item is carefully arranged in our exclusive birchwood crate to ensure safe and secure shipping. A free card is included with your personal message or greeting. Measures 9" x 5" x 4". Artisan Fruit Pâté Crate is a hand delivered gift. These gifts are delivered by one of our local design centers located throughout the United States and Canada. Same day delivery is available for most gifts when ordered before the cutoff time. The cutoff time for Artisan Fruit Pâté Crate is in the recipient's time zone. Natural Olive Wood SpoonHard, strong and durable, the carved olive wood of this spoon will never interfere with the delicate balance of your food's flavors. Just like the trees in a grove, two olive wood spoons are identical. 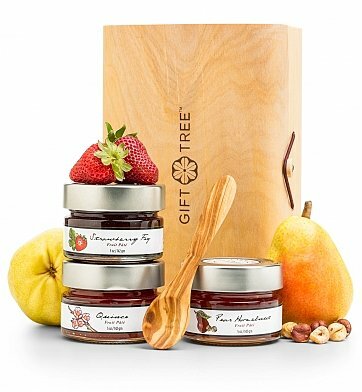 Strawberry Fig PateThe bright flavors of Oregon strawberries are perfectly balanced by earthy figs to create a smooth, delicious condiment, perfect for soft ripened cheeses like brie, camembert or goat cheese. Gluten-free. 5 oz.